On October 26, High School Forensics students, in a lesson well-suited for the Halloween season, stepped out of the classroom and onto an artificial crime scene for a practical forensics analysis exercise. One of the first steps in learning about forensic science is what to do when you arrive at a crime scene. Crime scenes provide information and clues that must be carefully, scientifically and legally collected in a relatively short amount of time. Emergency Response Teams (ERT) get one chance to gather all the evidence they can before the scene is cleaned up. 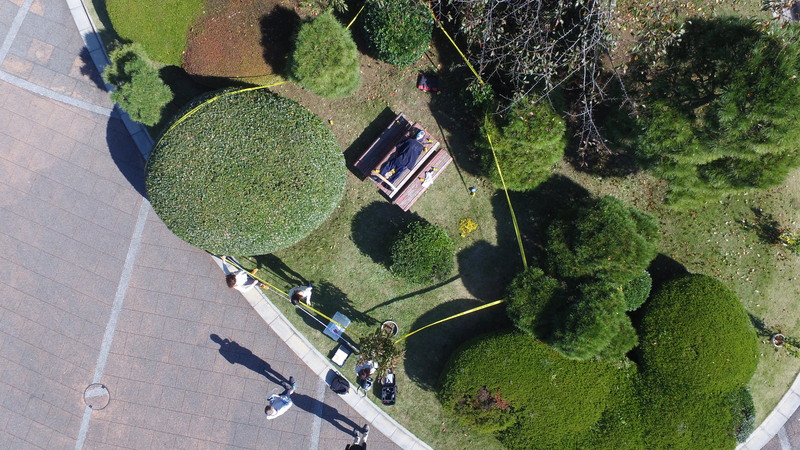 Some of the skills required in crime scene investigations can be learned, including isolating the scene, dealing with media and systematically logging discovered evidence. However, determining what is and is not useful evidence at a crime scene comes with practice. The ASIJ forensic class was split into ERTs and asked to investigate four different crime scenes. Each scene was unique and required different processing skills however, all of the scenes also required an attention to detail. The scenes were investigated, sketched, photographed and evidence was logged. Students were even tasked with keeping the media at bay, as ASIJ News learned upon arrival at the crime scenes.